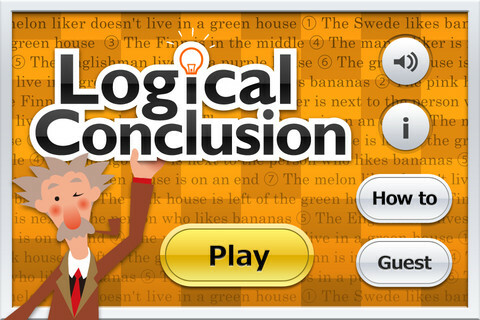 Logical Conclusion, developed by Enfour, Inc., is one of those games that definitely isn’t for everybody. 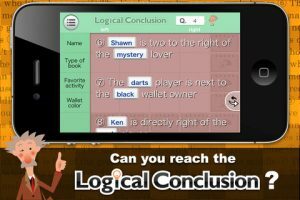 It draws heavily on classic logic style puzzles, the sort of brainteasers many of us had to do in school or on standardized tests. If you weren’t very good at those sorts of puzzles, these head scratching word puzzles might just give you a flashback to your school days. I personally was never very good at those puzzles, but they were a lot of fun. And so, it turns out, is this game, especially when you consider the wide array of relatively mindless time-wasters available in the App Store. Unlike the drudgery of solving these logic puzzles in school by using a pen and paper (or worse, just your mind), Logical Conclusion has a mechanism where you can “pop out” relevant clues and key phrases. You then place these phrases on a grid, where you can see if you have placed them correctly to solve the puzzle. 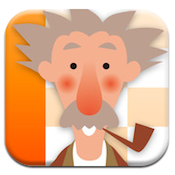 That mechanic makes all the difference when it comes to turning stodgy old logic puzzles into an interactive iPhone brainteaser, and it’s the sole reason I’ve become so enamored with Logical Conclusion. Yeah, the logic puzzles are great, but Logical Conclusion would be way more frustrating without a way to check you progress as you go along. Thankfully, your game gets saved automatically as you progress through each challenge. That’s perfect for when you have an interruption mid-game that breaks your concentration. 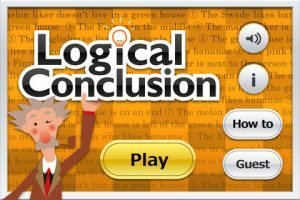 If you’re looking for a change of pace after playing too many Angry Birds knockoffs, Logical Conclusion definitely sets itself apart from the rest of the iPhone game crowd. The app is billed as “Sudoku with sentences,” but it’s so much more. Logical Conclusionis compatible with iPhone, iPod touch, and iPad. Requires iOS 4.3 or later.